This cabinet was loaded down with stained glass, paper, collage items, beads, glue and such ... In general, a large and inefficient hodge podge. I emptied it all out, shelf by shelf, deciding each step what it was, if it should be kept, and where it should be kept ... or how disposed. Some to recycle, some to Grans, some to Ebay. 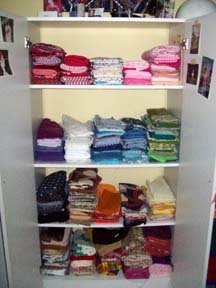 Then, once empty, I carefully sorted and stacked all those fabrics I've been gathering over the last few months. This should make sewing awhole lot easier ... versus searching through a bunch of different boxes looking for what belongs together.